Every guitar player should have a 12-string acoustic in their arsenal. Not only are they great fun to play, but they can really help to fill out your recordings and live shows, due to their naturally big sound. Even if you're just strumming those simple, open chords, a 12-string will give them an extra layer of richness and vibrancy. While it's true that you get what you pay for, there are three 12 string acoustic guitars under the $350 mark, each with very different tonal qualities, that can jangle right up there with more expensive models, and will prove a satisfying long-term playing investment. Best For Guitarists on a very tight budget who still want a quality, bright sounding 12 string. Guitarists who want a well balanced 12-string sound on a small budget. Guitarists who want to spend a bit more on a solid top 12 string with a richer, balanced sound. For those on a tight budget, Epiphone's DR-212 has proved a hit among acoustic players, and especially beginners or those moving from 6 to 12 strings for the first time. Don't settle for a thin sounding 12 string just because you're on a shoe-string! The cheapest of the three picks, yet still a resonant and beautifully crafted 12-string, with the benefit of Epiphone's "slim taper" neck (a precise, varying thickness from 1st to 12th fret intended to reduce player fatigue). The DR-212 produces a surprisingly cutting tone, but the mahogany gives it just enough fullness. It's bright, balanced more towards mid-high end presence in comparison to the other featured 12-strings. With the more standard neck width, in comparison to the narrower Yamaha neck, it could be said the Epi is more comfortable for the finger pickers. The brightness also means that, if you're strumming on stage or when multi-track recording, you'll be sure to cut through the mix with this 12 string. What it lacks in low end warmth it makes up for in mid-high end presence and volume. The mahogany back, sides and neck helps to maximise sustain. Quite a number of experienced players of 25 years + have expressed how pleased they were with their budget Epiphone purchase. It certainly seems to meet all the main criteria people look for in a 12 string, and it has its own unique sound that means any comparison to the "big boys" is rather subjective. The DR-212 stands proudly on its own. A step up from the Epiphone in terms of on-paper specs. The Fender CD100 offers scalloped bracing for a fuller, more well rounded sound than the DR-212. You also get Fender's famous C-shape neck profile for quick, comfortable playing up and down the neck. This is a standout spec for most who opted for the Fender over the Epiphone. Another notable feature is the compensated "Nubone" saddle, which in simple terms means more fine-tuned intonation for those higher fret moments. It still lacks the solid spruce top of the Yamaha (see below), as reflected in the price (around $250 at the time of writing this). But the mahogany back and sides give it enough fullness and richness to satisfy most ears. While it appears to be on par with the Epiphone DR-212, there are some nice additional features (the scalloped bracing, compensated saddle and C-shape neck) that justify the moderately higher price tag - a mere $20 more at the time of writing. And of course, the Fender name itself will surely add a slight premium. 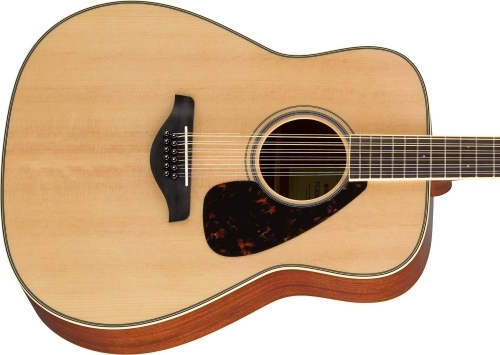 Yamaha have ruled the budget acoustic market for over 20 years. And for good reason. 6-strings such as the FG800 have garnered an unmatched reputation from new and experienced players alike for their solid fit, impeccable finish and rich, full tone. The FG820-12 is based on the same principles and, although it's still gathering reviews due to its recent appearance on the market, early reviews suggest it has improved on the acclaimed FG720S-12 model in the same way Yamaha's new FG800 6-string improved on the FG700. Boasting a solid spruce top (for more depth), mahogany back and sides and a rosewood fretboard and bridge, the FG820-12 is virtually identical to its 6 string brother. Also identical is the build quality and tuning stability provided by what at first appear to be cheap machines, but which nevertheless do a fine job. The neck still conforms to Yamaha's slim, fast profile which is especially great for those 12 string virgins. However, bear in mind this may make it more difficult for finger picking, as some users have commented. However, for the usual 12 string role of big, strummed chords, Yamaha's narrower neck may actually make things smoother, especially for those with smaller hands. Tone wise, the 820-12 instantly delivers that rich, coursed shimmer people buy 12 strings for. It delivers it in a way that, to experienced ears, diminishes the perceived value for money on much higher priced instruments. As a full dreadnought, there's plenty of low end presence which is balanced well enough to take the edge off what is naturally increased treble on 12 strings. No tinny highs. Responsive attack. Nobody expressed any doubts about gigging with the FG720S-12, and the 800-12 will confirm that further. In the cheap 12 string acoustic guitar market, the 820-12 easily blows all others out of the equation. Don't bother looking for something better unless you have at least $300 more to spend.